The Japan Pavilion in Epcot's World Showcase has two dramatic structures that are pictured here that are based on two of the more famous Japanese historical landmarks. The first is the Torii Gate. The Epcot version is based upon the Torii Gate found in the Hiroshima Bay at Itsukushima. The original was built around the 12th century AD and they are made of camphor wood. The roof is made of thatched Japanese cypress bark. The entire structure is coated with vermilion lacquer. It stands in the sea about 500 feet from the Main Shrine. The four-pillar torii style was added when the torii was rebuilt in 1547. The current torii, which is the eighth, was built in 1875. The Epcot version does a good job of mimicking the true landmark. There are even fake barnacles that were added to the base to simulate the long years that it has been standing in the sea. The second landmark recreated at Epcot is the famous five story pagoda at Nara. In the Nara period, the pagoda was the most important structure in the temple complex as it held the relics (such as a bone or tooth) of a Buddha. There are two pagodas in the Kofuku-ji complex. . The Goju-no-to (Five Storied Pagoda) was built in 725 by the Empress Komyoh, and the current structure was restored in 1426. 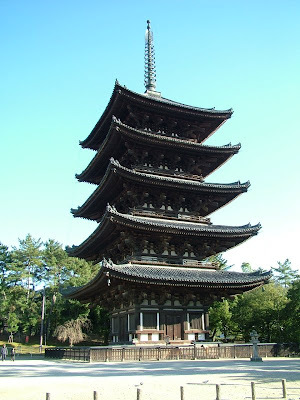 It is one of the symbols of Nara and is the second highest pagoda in Japan with a height over 150 feet tall. The Epcot version is amazingly similar to the original that is pictured. The Disney World Imagineers go to great lengths to create the structures used to tell their stories and to immerse you into a believable creation of the country that they are creating. The next time you visit Epcot, spend some time in the Japan Pavilion and take note of all of the exquisite detail that goes in to the Torii gate and the Goju-no-to Pagoda. 3 comments to "Epcot's Japan Pavilion Recreates Japanese Landmarks"
Thanks for the information. Just went to Epcot and thought they were both very nice. I have been to both! Man,the shrine and Pavilion should be wonders of the world!